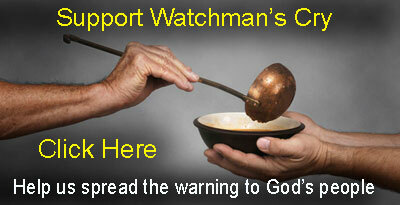 As watchman, I share warnings from time to time when they appear to be sound and legitimate. Today, I have such a warning. It was provided to me by my sister, who over the years has displayed a gifting of prophetic dreams. A few months ago, in early November 2018, she was given a prophetic dream of an EMP attack, but she didn’t tell many people about it until a few weeks ago, when I was talking to her on the phone and she mentioned it casually. She said, “I had a weird dream,” and then shared it. I held onto it and pondered it. I then sought the Lord about it, so I believe it’s time to share it with all of you. I do not know its time frame. Neither does she, but based on developments that are presently taking place in the world, I believe an event like this could happen at any time. I am not saying this to be sensational, I am saying this because peaceful diplomacy in the global landscape is deteriorating. I will be talking about this in the future. I am going to share the details of her prophetic dream in a moment and I want to say up front, if an event like this takes place, I do not know which part or how much of America will be affected, but if our enemy’s plans are successful, it will affect the entire country, and worse, would also result in a catastrophic loss of life for a large part of the population. When I heard her dream, I remembered the book, “One Second After,” and the movie, “Jericho.” This event could potentially resemble those adaptations. So I want to ask all of you to please take these matters to the Lord in prayer and ask Him about it. See if it bears witness with you. My purpose in sharing this is not to create sensationalism or fear. My purpose is to serve as a warning so that those who see the concern would then seek God to obtain a contingency plan in the event that it occurs. I notice that a lot of folks in Internet land often read warnings with a sense of excitement, talk about it for a few days, but then go back to normal life, which includes spiritual neglect. Everyone does it. They put off spiritual maintenance until the last minute, or until it’s too late. Please do not do this folks. There are many of you who are not living how you’re supposed to be living. And the truth be told, many preppers are not ready to meet Jesus. In fact, a large amount of preppers are more in love with the world and their bug out property, than the other place…our eternal bug out property, which is Mount Zion, the city of the living God. Is your Heavenly boarding pass ready, my friend? Do you possess the punch-card for our final exodus? Please remember to always include God in your plans. We are in a different season. We are living in the days of darkness. There is much deception out there and many hearts have grown cold. None of us can afford to neglect our spiritual life, because part of the reason that events like this are coming is to prepare us for His return. This is the other thing to keep in mind. As the days become treacherous, let us always keep our eyes on Jesus. So again, please do not read this warning, and then go back to sleep. Please share this with your friends and loved ones. Also, if you might happen to have thoughts about some of the symbolism in this warning, please let me know. We were on the freeway driving through Austin, Texas heading south on I-35. We were headed downtown. I was with my grown-up daughter and her friend, who was driving. I do not know the name of the girl driving, but I knew she was my daughter’s friend and I was in her car. I was sitting in the backseat on the passenger side. It was a small grey car. We were in the far right lane of Interstate 35. There were several lanes of traffic on this freeway. I looked out the window to my right toward the exits and saw cars behaving weird. They were rear ending each other. Slowly at first. I looked out the other window to my left at the traffic on the freeway. The traffic was moving at almost a regular pace, but the cars seemed to be coasting. I again looked to my right to the cars on the frontage road and noticed more cars were bumping into each other in rear end collisions. I looked further down towards the intersection along the frontage road, and cars were smashing into each other at the intersection. I then saw that there were many wrecks taking place. At first the impacts were minor, but as the scene progressed, it turned into a frenzy where many of the cars were smashing into one another in rear end collisions. The impacts became more violent, because some of the cars were cruising at highway speeds and did not appear to have brakes. They collided into the backs of one another. I saw this from the right lane of the freeway. I then looked up into the sky and saw three aircraft in the air; a helicopter, and two planes. In the distance, the small plane and a helicopter went down. They just dropped out of the sky. I also saw a passenger plane higher in the sky and further away, but it was coming in our direction. It was having problems. I could hear it’s turbine engines whining. When we got to the frontage road, I saw a gas station in the distance at the intersection. We coasted into the gas station parking lot. The car finally stopped. As we got out of the car, I looked into the sky. The passenger plane that I had noticed a few moments before was having difficulty and could no longer maintain its lift. I imagine the pilot was trying to glide it but was unable to. It went right over us. It was falling from the sky at an angle. I noticed that the cone on the front of the plane was black. The rest of the plane was white. For some reason I noticed the black cone. It crashed nose down onto the freeway with the great explosion. The impact was violent and very loud. It was about half a mile away. At that moment panic erupted. People exiting their cars running in all directions. Nobody knew what was going on. It was chaos. I saw that behind the gas station was a parking garage. It was made of concrete about three stories high. I was worried about more planes crashing, so we ran towards the concrete parking garage to seek shelter. I was very scared. At the garage, we lost my daughter’s friend. I don’t know what happened to her. But we ran into the concrete garage. Others had also sought shelter in the building to hide. I imagine they had similar concerns. Once inside, I told my daughter to call her friend on her cell phone. Miraculously, the phones worked, but not for very long. Just long enough for my daughter and I to make a call. I told him where I was. That we took St. John’s exit, and we were at a parking garage at the corner, behind the gas station along St. John’s. …. We were cut off and the phone went dead. It no longer worked. I found out later, that he wasn’t able to get the money out the bank, because there was no power, so we lost all our money. We ran further into the garage. We were worried about planes hitting us so we wanted to find safety deep inside its concrete. There were others there. People were crying, screaming, yelling. It was chaos. Some were asking – what was going on? In the midst of the chaos, pretty much everybody was freaking out. People were asking what’s going on? Speaking to no one in particular. But out of all of the people who were nervous and scared, there was one man there who is not afraid. He appeared very calm and he spoke with assurance. He was wearing a baseball cap, a green jacket, and blue jeans. He was standing by the edge of the garage, looking over the the concrete wall to the outside. He turned to us and said, “It is the apocalypse. The apocalypse has begun.” He said it very calmly. Then he looked back over the wall to the chaos that was outside the building. I tried to comfort her. I told her it was going to be okay, and that her uncle was going to come and find us. I told her he would and it was going to be okay. A duration of time went by as we were hiding and waiting. I’m not sure how long it was, but then some people from the government showed up. I don’t know who they were, or where they came from. But they consisted of several men and a woman. They were all wearing blue shirts. The lady was the leader. She was middle-aged, her hair was pulled back in a ponytail. She spoke with authority. She was wearing black pants and a blue shirt. She was also wearing a tan jacket. She began issuing orders to the people in the garage. She went over and stepped onto something to make her higher than everybody else. The men who were with her stood by her side and behind her. When my daughter heard they were going to separate us, she became frightened, but I assured her that they were not going to do that. I was trying to be positive. That was disturbing enough, but the lady also made it clear that none of us would be allowed to leave. At the time, most of the people did not seem to mind, because they were afraid of other planes crashing on them. They were also worried about the chaos that was taking place out on the street. The lady continued. She said that they were going to be there until order was restored. I then saw three golf carts appear. They were old, white with green seats. The amazing thing was they worked. They were not dead. I don’t know how that was possible. The lady told us that we could take turns riding in the golf carts inside of the parking garage. She made it clear that we were to remain inside the building within the premises. So the people began taking turns riding around on them. The main thing on my mind was hoping that my brother would show up. I did not know how he was going to get there, but he told me on the phone that he would. It became my turn to ride around on the golf cart. So my daughter and I got on it and we drove around inside the garage. We went to the edge to try to look over the wall. The man who initially told us that it was the apocalypse was also there looking over the wall for more things. He was very calm. I thought about leaving the garage in the golf cart, but I didn’t, because the man would have seen me leave. I didn’t know if he was friendly, and I also didn’t know if he would report me, so I stayed inside. I went to take a peek over the wall and looked towards the road. It was at that moment I saw a change in the scenery. Out on the highway, soldiers were walking on the road alongside military vehicles and equipment. There was a long row of them. The soldiers were wearing green camouflage and were walking alongside green military vehicles. There were several kinds including green Humvees and military trucks. Soldiers were walking alongside the moving vehicles. Every one of them had a red armband on their upper left arm. There was white writing on the armband. I do not know what it said. The military vehicles all worked. So apparently, they were EMP proof. The soldiers were clearing out some of the stalled cars and moving them. Making room for their moving convoy. The soldiers were telling everybody that help was coming. They also told people to move their vehicles if they could. Some of the cars had been wrecked and a few of the people had been injured. The soldiers helped some of them, but ambulances never came. Of course, how could they? They had probably been damaged by the EMP. If they were not military, then who were they? I didn’t know. One of the people in the garage saw and overheard my brother talking to me. He came over to us and said, “can you take us with you? The three of us, (my brother, daughter and myself) climbed onto the golf cart and drove away. We went to another section of the garage where there was a secret tunnel. We entered it and drove through the dark tunnel for a while. I don’t know how long we were in it. But eventually, we came to the end of it. I saw light approaching. Before I knew it, we exited the tunnel, and I was on the other side. I felt relief that we had made it. We escaped the darkness and found a way out. I say this because EMP warfare has become a part of the military doctrine of several of America’s opponents including; Russia, China, Iran, North Korea and others. I will be talking about this in the days ahead. At the beginning of the dream, the event arrived unexpectedly when people were going about their regular business and caught them off guard. This is how it’s going to happen. It will arrive on a normal day and strike without warning. My sister was on the freeway. When the EMP first arrived, it caught everybody by surprise, and some of the first fatalities occurred at the onset. She saw a helicopter go down, along with a small plane. The people in those aircraft perished, and most likely they had no idea what was happening. Accidents began occurring on the freeway, because the vehicles traveling at highway speeds suddenly stalled, and the drivers no longer had the convenience of their power brakes, or power steering. Multiply the scene by millions of cars. The results will be catastrophic. When I interviewed my sister, she mentioned that she took St. John’s Exit, but didn’t think about it. Prophetic dreams often have symbolism that is hidden in the details. As the dream progressed, the same man remained by the wall of the garage. He stayed there the whole time and looked at the things that were taking place outside of the garage. How did he know this? I will visit more of this in a moment. But getting back to St. John’s exit. Ladies and gentlemen, in the Bible, St. John’s Exit is our exit! It is the return of Jesus and our rescue to Mount Zion. St. John’s Exit is the gathering, it is the harvest. And to be included in St. John’s Exit requires that we are living for Jesus and ready to go at a moments notice. My sister took the exit ramp towards St. John’s. They coasted towards a gas station that was located at the intersection of the frontage road and St. Johns. They managed to make it into the gas station parking lot. As they got out of the car, she saw a large passenger plane descend over her and crash onto the freeway. The plane had a black nose cone. Black nose cones were common on aircraft several decades ago. The nose cones of planes contain radar equipment, and apparently, part of the reason that nose cones were painted black back then was to try to minimize interference to the radar equipment that is located under the nose cone. For the most part, this practice is no longer necessary because the airline industry has come up with different composites that are able to minimize radio interference that might try to affect the radar equipment located in the radome which is the dome area under the plane’s nose. Why did the plane in this dream have a retro-looking black nosecone? I have wondered about this. I think it may have to do with the purpose of the black nosecone and what it represents. The black nosecone represents the plane’s ability to function with radar and radio signals. But in the dream the planes equipment failed. It could not withstand the EMP and it crashed to the ground. The crashing plane awakened everyone. It was loud. It was scary, and it thrust everyone into mode of panic and chaos. She saw everyone running in terror. When the EMP event occurs, its arrival will not be casual. 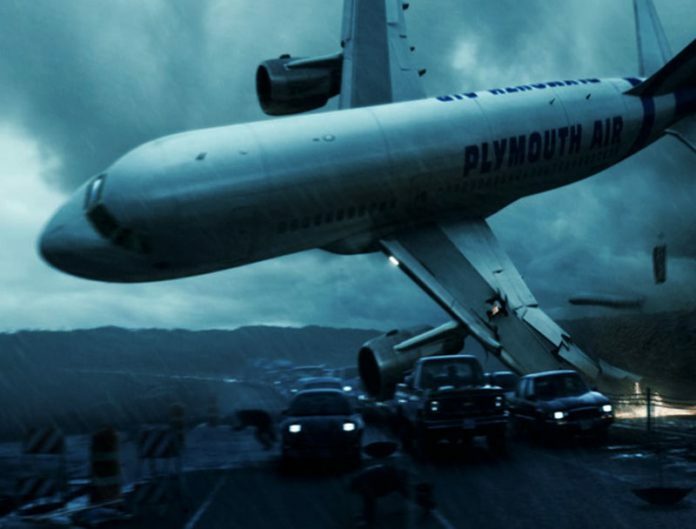 In the city, its impact will hit the ground with a thud, as planes fall from the sky. Chaos and confusion will ensue. There will be no going back. She tried to make a phone call. Initially, she was able to get through. But then the phones failed. Some might argue that in real life, her cell phone might not have worked, that might be true. An EMP will probably destroy all electronics at the same time. Why did her phone work in the dream? I don’t know. But let’s look at the substance of a warning, communicating with loved ones. If some people are able to initially get through to their loved ones, the conversations will not last very long. What does this tell us? It means that when a national emergency like this arrives, many people will not be able to talk to their loved ones. They will be left in the dark. In silence. They will not be able to communicate with family members or loved ones. I cannot imagine the horror of such a thing. I would hate to be caught at one location, unable to speak to family members. We have become a society of instant communication. We have Messenger PMs, InstaGram DM’s, but what if all of that was gone? What will people do when they are stranded? Alone? The mental anguish will be very difficult. She called her brother on the phone. They tried to make a plan. Right before the phones died, she asked him to get the money out of the bank. But it was too late. When the EMP arrives, people will be unable to withdraw their money from the bank. Their assets and net worth will vaporize into thin air. Their nest egg will disappear. If they have no money saved at home, the ability to buy and sell will become difficult for many people, because the EMP will erase their hard-earned paycheck that was sitting at the bank. Russia and China know this. They call it, “Cybergeddon, or Blackout War.” And its purpose is to wipe out the United States from within. It is to take down the grid, and destroy America’s financial system. Was it true? Is it true? Will the approaching tribulation include an EMP event? 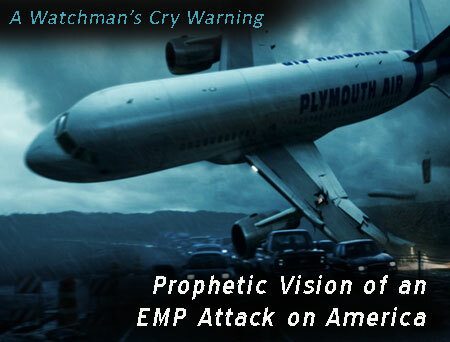 Or will an EMP event precede the tribulation? I find it interesting that one of the bowls in Revelation that is poured out on the earth mentions darkness. Could this be an EMP event? I do not mean to digress, but I just wanted to mention this, because I found it interesting. While she was hiding in the garage with others, a group of people showed up from the government. She described them as all wearing blue polo shirts. The leader had her hair pulled back in a ponytail and was wearing black pants. I wondered what agency this could be? 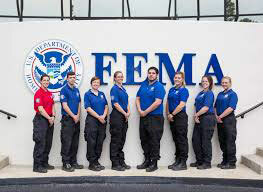 So I searched and searched online to see if there was an outfit that is worn by government workers who are involved in emergencies and if so, what agency is it? It didn’t take long to find. 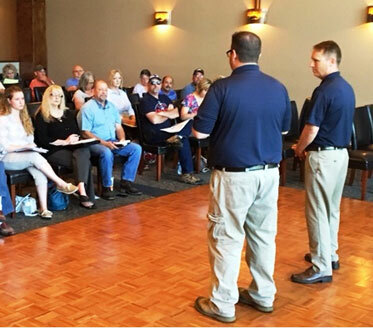 Apparently, FEMA workers wear blue polo shirts when they’re doing their FEMA thing. Make note of images below. Sometimes the pants are beige. While I cannot say for sure if this was the agency in her dream, I have a suspicion that it might’ve been. 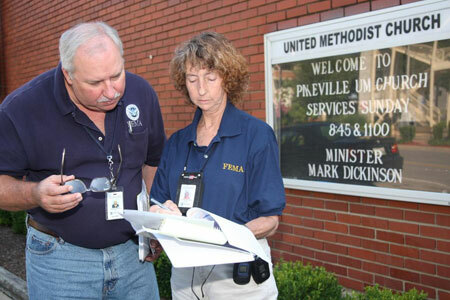 Therefore, for the sake of simplicity, I will refer to them as the FEMA people. It’s interesting that the FEMA people showed up and immediately took charge, and part of their policy was to keep the people in the dark about what was going on. In the dream, they feigned ignorance, but in reality, if an EMP event occurred, FEMA would know what was going on. The FEMA lady then told them they were going to separate the people into groups and sections. Why would this be necessary? It isn’t. But to get control over people, Big Brother will destroy the people’s comfort zone and their confidence. I can see this happening in the future, because we’ve already seen in the past. What does this mean for you, God’s child? It means that that we must have God on our side, and become acquainted with His voice. We must become familiar with His guidance that helps us to navigate the day-to-day things while it’s peaceful, so that we can be ready for when it’s not. I am not sure what the golf carts meant. I also do not understand how they were functional after the EMP. Scientifically it doesn’t make sense. So I wonder if the golf carts represented something else? The origin of the golf carts was provided by the FEMA people. Does this mean they were distractions to keep the people occupied? Were they psychological trinkets to buy the people’s favor? The man who mentioned the apocalypse was wearing a jacket, so was the FEMA lady. Is this an indicator of the season of the event? It was not a heavy coat, which eliminates the winter. So did the event occur in the spring or the fall? I don’t know. But I wanted to mention it. Which in turn, will activate the National Guard, curfews, a takeover of both public and private assets, free travel, communications, food distribution, and other things. 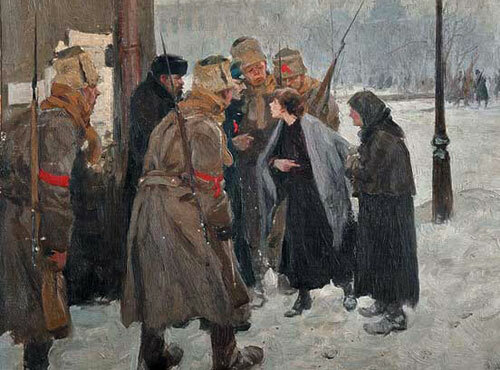 In the dream, the soldiers were wearing red brassards with white writing on them. To my knowledge, aside from the Red Cross, red brassards are not worn among the US military. In past history, members of the Royal military police of Great Britain have used red brassards. But the soldiers in the dream were wearing red arm band brassards on their left arm. Who were they? Were they friendlies? Were they National Guard Troops with an EMP Assignment? Or could they have been soldiers from another country? 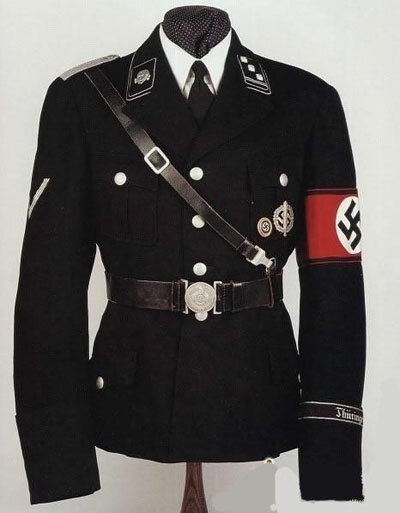 and also Adolph’s Fascist Totalitarian Army. Is this what it meant? Could an EMP crippled the United States and turn it into a communist or fascist plantation? This is something to definitely think about. We do know that the Bible prophesies a totalitarian world government at the end of time. Would an EMP be the catalyst to thrust us into this time frame? The man in the dream who seemed to know what was going on possessed an insight that no one else had. Who was he? Was he an angel? Was he one of God’s watchmen who was dedicated to his job? In the end times, the Bible prophesies that God would raise up watchmen who would have no rest, as they watch the nation of Israel, and the horizon for coming events. This is the work of God. God raises up watchmen. I’m not talking about the pretenders, or the wannabes. I am talking about real watchman have been given a spiritual prophetic gift to hear the voice of God and see events through His eyes. They are out there brethren and they have an assignment to sound the alarm and blow the trumpet as they see the day approaching. At the end of the dream, she escaped through a dark tunnel. Light was on the other side. The wind was blowing. The sun was shining. And she experience joy and happiness to have escaped. Does this mean that everyone reading this needs to find a tunnel when an EMP happens? No. I believe it means that everyone of us needs to obtain and possess the faith that God will be there for our protection, direction and provision to see us through. We must also have the knowledge that in the future, we will all have to travel through the darkness, and endure throughout its duration, so that we can make it to the other side. Because friends, on the other side of the darkness, is our redemption, our rescue, our hope, our Savior and Lord. On the other side of the darkness, God is waiting to smile on you, and see you exceeding with great joy. Many challenging events are approaching brethren. When they arrive, it’s going to be scary. Maybe even frightening. But as God’s children, our job is to get full of Him and grow closer to Him. As I said at the beginning of this warning, some of people who are reading this are not ready to meet Jesus. They have procrastinated with their relationship with God. And they know it. But neglect never serves anyone. It does not build, or heal. Please do not neglect your salvation. If you are struggling in your relationship with God. It is time to bring your hurts, burdens and pain to the foot of the cross. He’s waiting my friend. He loves you.